(Seychelles News Agency) - Fifty law enforcement officers in Somalia have been given basic training in crime scene investigation, first aid, communications and navigation, firefighting, basic boarding and intervention techniques, swimming lessons, the International Law of the Sea, and human rights and gender issues. This is the first such training provided to Somali law enforcement officers by EUCAP Nestor, the European Union’s maritime capacity building mission in the Horn of Africa and Western Indian Ocean to further enhance the trainees’ skills to proficiently and confidently carry out their duties within their respective law enforcement agencies. 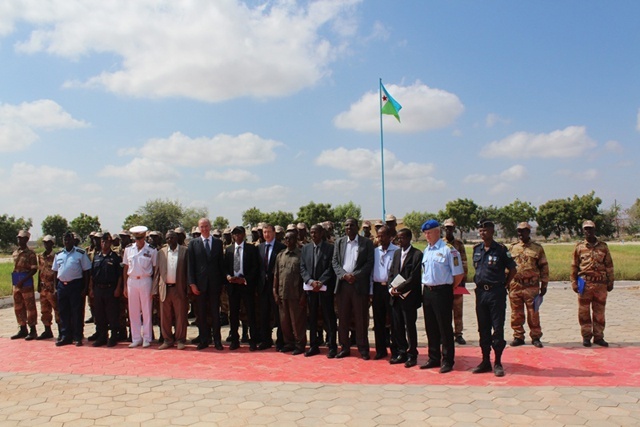 The Somali trainees from various regions of the African nation’s Coast Guard and Port Police spent six weeks at the camp of the Djiboutian Gendarmerie, from April 22 to May 29. According to EUCAP Nestor the course was developed in close cooperation with Puntland and Galmudug authorities, two autonomus regions of Somalia. The training which comprised of both theory and practical exercises was conducted by seven specialized trainers from EUCAP Nestor with the help of legal and maritime experts as well as trainers from the French base. “We are pleased for the engagement of the Federal Government of Somalia and the regional entities of Puntland and Galmadug and look forward to continued collaboration on strengthening maritime security in the region,” he added. For his part EUCAP Nestor’s Head of Mission, Etienne de Poncins attributed the success of the training to the invaluable support of all partners involved. “Our efforts will not stop here and in the coming months a series of events are already foreseen such as a Regional Prosecutors Conference as well as another 6 weeks training for new recruits from Somali Maritime Security entities,” said de Poncins. On top of their newly acquired skills the trainees have also received some equipment including uniforms, sport outfits, first aid kits and life jackets that the can be used in the execution of their tasks.